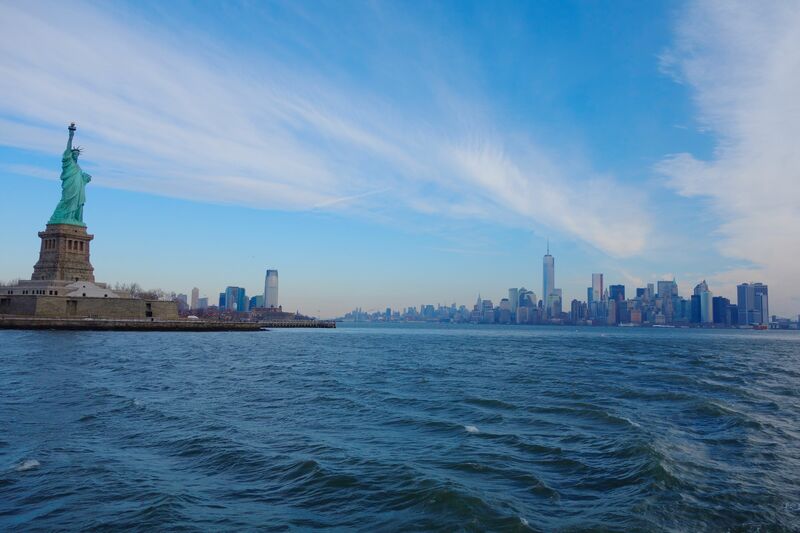 Taking a ferry boat from Manhattan to Liberty Island is easy and rewarding. Our last day in New York granted me and Rick some much-welcomed alone time; Jackie, Linda, and Caleigh had returned home, Nikki was off to Vienna, and Andy caught up on some sleep. The early morning was crisp, and our heavy coats, gloves, and hats were little match for the windy chill off the Hudson River. Cruising on a ferryboat to Liberty Island and Ellis Island, where so many immigrants had first come to America, our patriotic pride swelled as we passed beneath the gaze of the Statue of Liberty and looked back at the Manhattan’s ever-evolving skyline. Both of us–like the majority of our fellow citizens–are descendants of immigrants. My parents came to America from the Philippines in the mid-60s. Rick’s great-grandparents on both sides of his family emigrated from Norway. We often remark on how grateful we are that our families took the risk to leave their homeland for the prospect of a new life with better opportunities for themselves and their loved ones. And we’re both impressed by how quickly a family intent on assimilating and embracing what America is all about can become integral parts of our country. Every day, ferryboats make hourly trips to see “Lady Liberty” (her French name is Liberté elcairant le monde or Liberty Enlightening the World) and are generally packed to capacity. 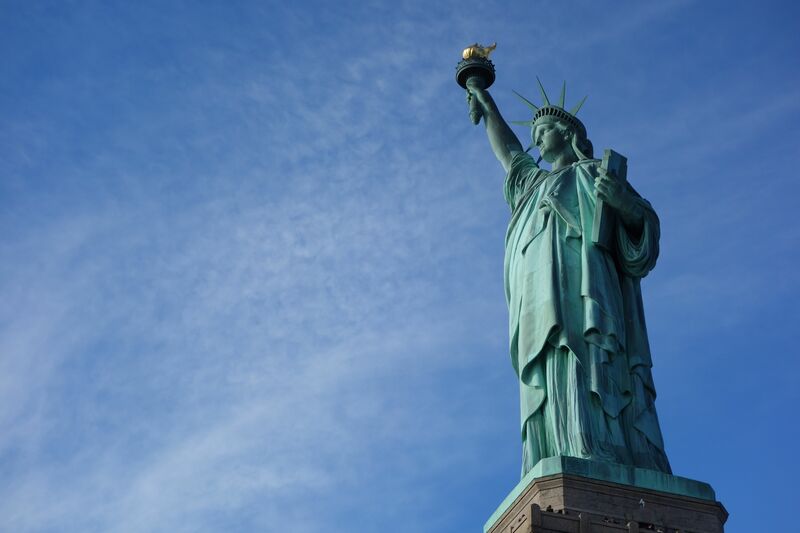 As a gift from the French for the centennial celebration of America’s birth, she has stood majestically on Liberty Island since 1886 as a beacon of hope and opportunity for all. Emma Lazarus wrote, “Give me your tired, your poor, your huddled masses yearning to breathe free, the wretched refuse of your teeming shore. Send these, the homeless, the tempest-tossed, to me; I will lift my lamp beside the golden door.” Looking at the other smiling passengers on the boat and listening to the happy cacophony of languages and accents humming in the air, I understood that we were all sharing something more than a sightseeing excursion: we were united in our desire for the universal–not just American–freedom and hope that the Statue of Liberty has come to symbolize. As visitors stroll at their own pace with our audioguides, everyone takes advantage of the great photo ops. Dealing with the chill of that blustery day along with the literally teary emotion of standing before the Statue of Liberty, I found it challenging to keep myself composed for any stretch of time. We listened to the informative and insightful audioguide that told stories of the construction, the structure, the symbolism, and the history (some of it conflicted, as when women were barred from attending the dedication ceremony). A full spectrum of feelings flooded through me: gratitude, pride, pity, wonder, humility, shame, frustration, admiration, and hope. It was a helpful reminder that while we’ve come a long way as a country, we still have much progress to make. We continued our route to Ellis Island. Used as an inspection station from 1892-1954, more than 12 million immigrants were processed through this facility–about 40% of today’s U.S. population can trace their ancestry to those who came through this island. Still, many were refused entry due to illness, insufficient funds (the U.S. wanted to be sure you could sufficiently get by, at least for a while), improper “moral fitness”, and (at one time) illiteracy. They were sent back home on the same ships upon which they had arrived. 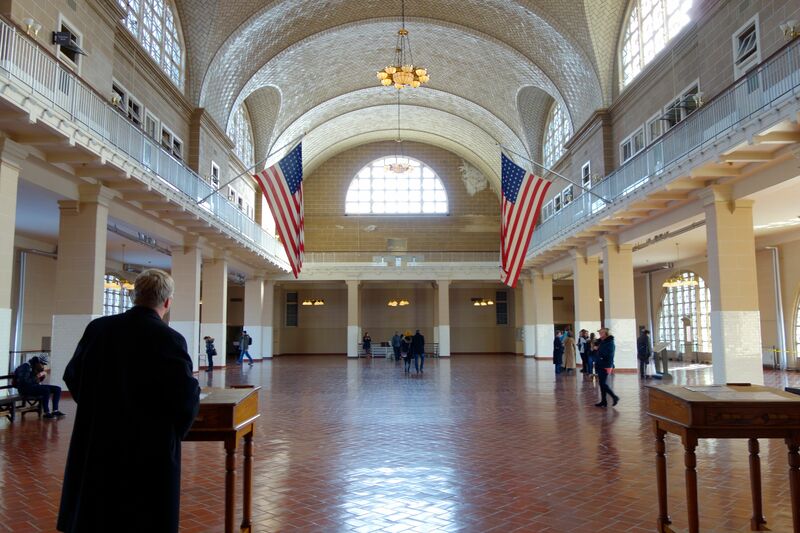 The Great Hall: 12 million hopeful immigrants waited here to be processed for entry into the United States. While the museum is scant and original artifacts are lacking, it was nonetheless impressive to stand in the Great Hall, where travel-weary, seasick, and disheveled people full of aspirations–to 10,000 a day–had come to gain access to a better life. We finished our visit with 20 minutes to kill before the ferry back to Manhattan. A white-haired woman approached us and said, “Have you tried our new records database? 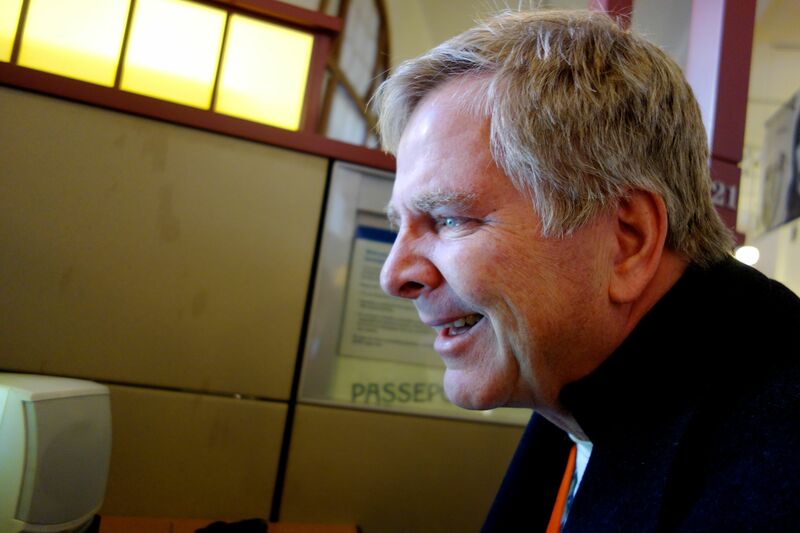 We officially opened it this morning.” Intrigued, we sat down at a computer terminal and input info about Rick’s biological great-grandfather (Rick’s dad was given the last name of his stepfather). It was a total shot in the dark because we didn’t know much about him or how he actually came to the U.S. We knew his first and last names, and we calculated a rough estimate of when he would have left Norway, based on when his son (Rick’s grandfather) must have been born. John Romstad. ; 32; traveling with Nels Tornfeldt; laborer; Norwegian; last residence, Namdalen; port of departure, Liverpool; final destination, Duluth; possessions, £25; joining a relative, No. 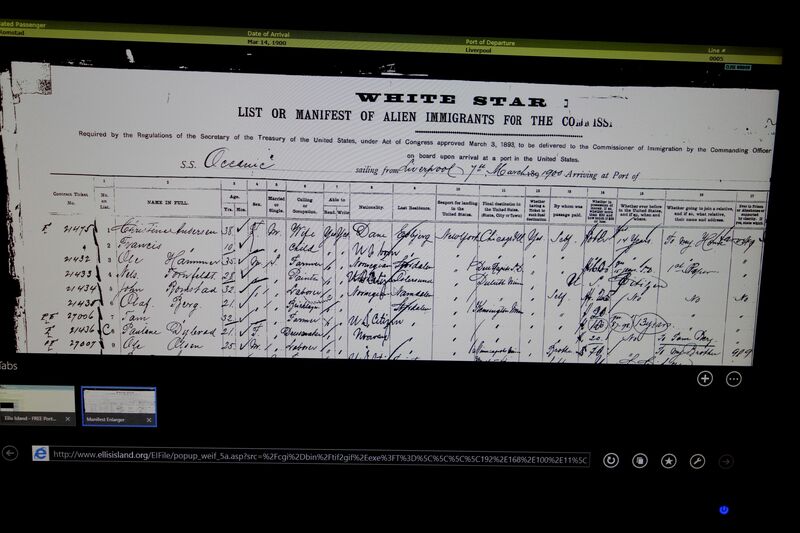 The manifest for the White Star and proof of Rick’s great-grandfather entering the U.S. through Ellis Island. Thanks to the Ellis Island digital records database, Rick has found his great-grandfather. We stared at the screen through the distortion of water-filled eyes. It was the second time that day that Rick and I had cried. But this time it wasn’t because of a connection to humanity at large, but rather because Rick had just unlocked a key to his own family. Suddenly, the past and the present were aligned, and Rick added a new dimension to his identity and personal history. We rode the ferry back to Manhattan but felt like we were floating on clouds, still stunned and elated by the historical discovery we had made. We imagined John’s struggles to leave his Norwegian family, to save up enough money to journey across the Atlantic, and to start anew in a foreign land. If not for the sacrifices and efforts of his great-grandfather, who knows where Rick would be today. We are the sum of the lives, the histories, and the knowledge that come before us, and now Rick had a new piece to help complete his own puzzle. Thank God for John and his quest for a new life in country that embraces freedom, and thank the U.S.A. for welcoming him into a country where people can reach for the sky and get there. One World Trade Center rises high above the Manhattan skyline as the tallest skyscraper in the western hemisphere. 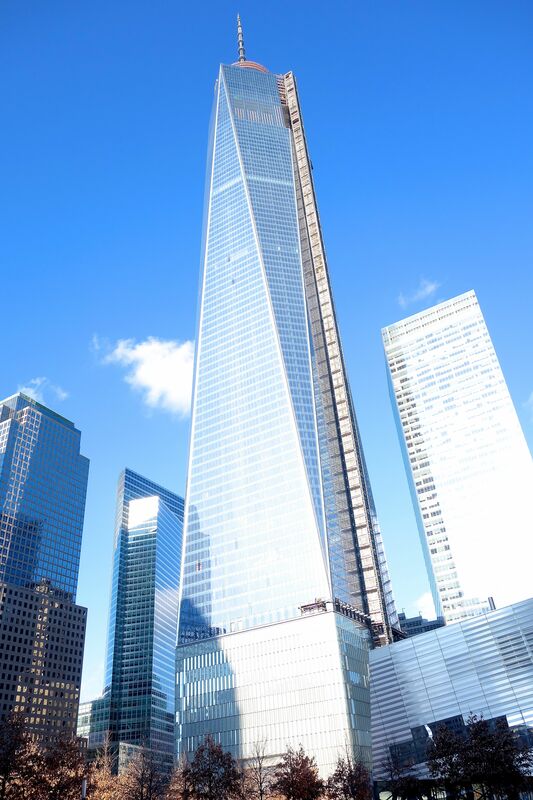 Back in the city, we finished our day at New York’s newest symbol of hope and freedom: One World Trade Center. Andy joined us there. The crowds were plentiful at the National September 11 Memorial, but the scene was tranquil and reverent. 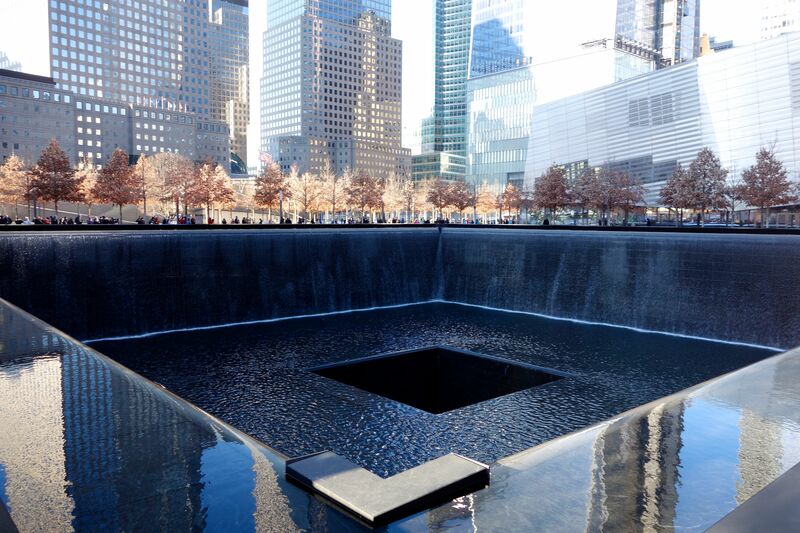 Sheet-like cascades feed enormous square memorial pools on the footprints of the Twin Towers, representing the tears shed by people around the world for the tragic and cruel loss of life on 9/11. For many, it’s a past that is still so near and one that has greatly changed our present-day lives…some would say for the worse. But like an exclamation point of optimism, America’s monolith of Freedom, towers above the cityscape. It is a feat of engineering and a new beacon of triumph, rising figuratively and literally from the ashes, towards the clouds, proud and sure. Sheets of water fall endlessly into one of the square pools where the Twin Towers once stood. We mostly kept silent as we wandered the grounds at our own pace. When the three of us came together to reflect on our perceptions, it was clear how impressed we were by the layout, the architecture, the grandness, and the intimacy of it all. But for us, the message–which is as true now as it has ever been and will always be–was the biggest highlight: hope and freedom will always triumph over fear. I’m so glad we ended our trip to New York on such a high note. While this was meant to be a family vacation, it ended up being a powerful learning experience on so many levels. We embraced the multi-faceted culture of New York City, made stronger connections to the city through a family member’s art, grew closer as a family, discovered new links to America’s and our family’s past, and bolstered our hopes for a promising future. Our lives have been enriched and enlarged by this jouney. And isn’t that what travel is all about? Lovely post! And yes, these experiences are just what travel is all about! Perfect ending to a family vacation! Beautiful post!!! I will continue to read ur blog, bec you share your emotional, intellectual, and etc reactions to your travel experiences. Many ppl posting online could learn MUCH about How To Write A Great Blog from the breadth and depth of your postss; you draw us right into your experience=FANTASTIC. Thank you, and always keep tapping into the real,bec it’s so much fun to read!!!! Thank you so much! I’m really touched by your thoughtfulness to share your comments, and I hope to keep writing blogs you’ll enjoy. Take care!